PIKO has lovingly realized the details of this little GE 25-Ton model. The completely newly-tooled design is convincingly finished and decorated. 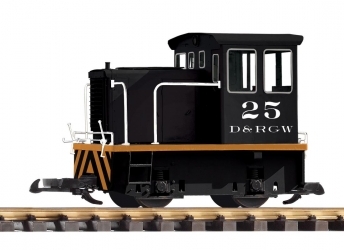 The model is finely and accurately detailed, yet robust enough for the rigors of garden railroad usage. The PIKO model features all-wheel gear drive, precisely-made wheelsets and reliable power pick-up from the track. While many may rightly regard the appearance as somewhat "cute", this faithful scale model of a popular prototype, with its excellent value and proven PIKO performance, will no doubt find many friends.